When you just have great 8th birthday wishes to choose from, finding the perfect one is a sure thing. You're sure to find perfect 8th birthday messages here. What makes a birthday greeting perfect for an 8 year old? Obviously, an 8th birthday greeting has to be interesting enough to get his or her attention. But what makes a birthday message interesting and the right one to choose? Read Message Guy's Tip #90 below to find out. ... money, friends and, more than anything else, Mom, to name just a few of the things that interest your average 8 year old. The full list is anybody's guess but the best indicators of what's going on inside their 8-year-old minds (and what would be the best birthday messages for them) are the social and emotional milestones they share at this age. 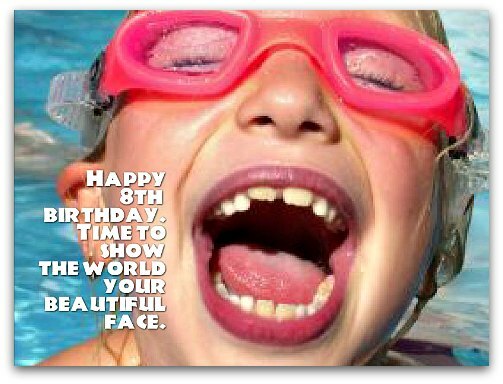 All in all, the 8th birthday wishes you decide to give should primarily be sentimental or happy in style with cheerful, optimistic messages to appeal to 8-year-old birthday girls and boys, making them feel incredible on their most special day of the year. You will see many 8th birthday wishes that fit description...just a few inches down. Happy birthday! Your 8th birthday totally rocks — because you totally rock. Let's rock until we drop! Happy 8th birthday! Waking up to your sunshiny, smiley face every morning for eight years have been the best of my life. Now that you're 8, you deserve to be hugged and kissed eight times. That`s because you’re eight times sweeter today! Happy 8th birthday! ...had this big, goofy smile on my face. There's probably nothing nicer than hearing someone (like your mother, father, grandmother, grandfather, uncle or aunt) express these wonderful sentiments about you on your birthday. Who wouldn't want to hear these words? Nobody. These are words of love that any 8 year old would eat up. Eight years back, you came into our life and made everything better. Today, you are 8 years old and everything's better than ever. Happy 8th birthday! Happy birthday! Let's celebrate your 8th birthday like it's the biggest party of the year — because, to me, it is. Wow, you're EIGHT! That's means you're Extraordinary, Impressive, Great, Hip and Terrific. Happy 8th birthday! 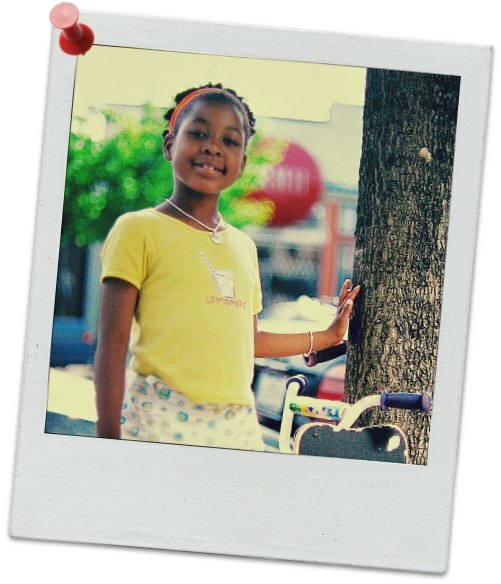 Wishing you an 8th birthday that's the talk of the block, school, even the town. Need to look at more examples? 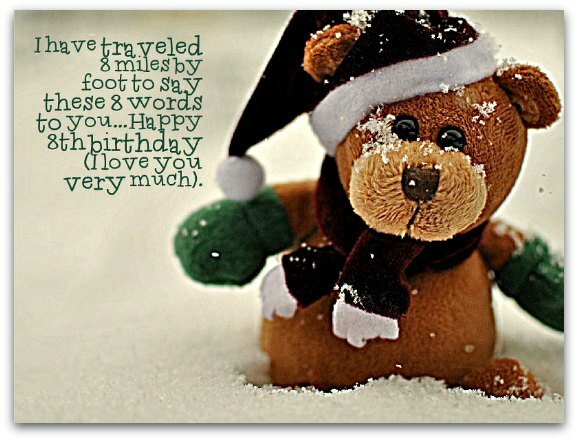 May your 8th birthday be the best you've ever had...full of friends, surprises, hugs, gifts, cake, ice cream and love! It's hard to believe it's been 8 years since you were born. Every one of them have been truly wonderful! Happy 8th birthday! Happy 8th birthday. Hope the birthday fairy grants every birthday wish of yours, so you get everything you deserve (like lots of cash). Eight years ago, you entered our world miraculously. Today, you turned 8 years old and are a greater miracle than ever! Happy 8th birthday! Today, you reached the age of 8, so I have eight "happy birthday" wishes to share with you: I wish you love, happiness, health, wisdom, dignity, success and fun. Happy 8th birthday! Happy 8th birthday! Whatever your dreams, keep following them until they come true. Then, dream up even more! Dreams do come true, especially when the dreamer is as dreamy as you are. Happy 8th birthday, princess! Happy 8th birthday to the coolest of the coolest, smoothest of the smoothest and cutest of the cutest in town. You're the best BFF a best friend can have. Have the best 8th birthday ever. For your 8th birthday, I have 8 birthday wishes for you: may you be happy, healthy, inspired, wise, proud, loving, loved and yourself. Wishing you the eyes to see yourself as I see you: simply wonderful. Happy 8th birthday. Happy 8th birthday, my beautiful one. I feel so blessed to have a child like you. You bring me such joy. I love you.